Prepare for the activity by cutting the straws into inch long pieces. You will want around 50 pieces or so. Put all of the pieces into the large bin. Place the pipe cleaners in the bin as well. Put the bin in an appropriate area for play. Invite the child to thread the straw pieces with you. 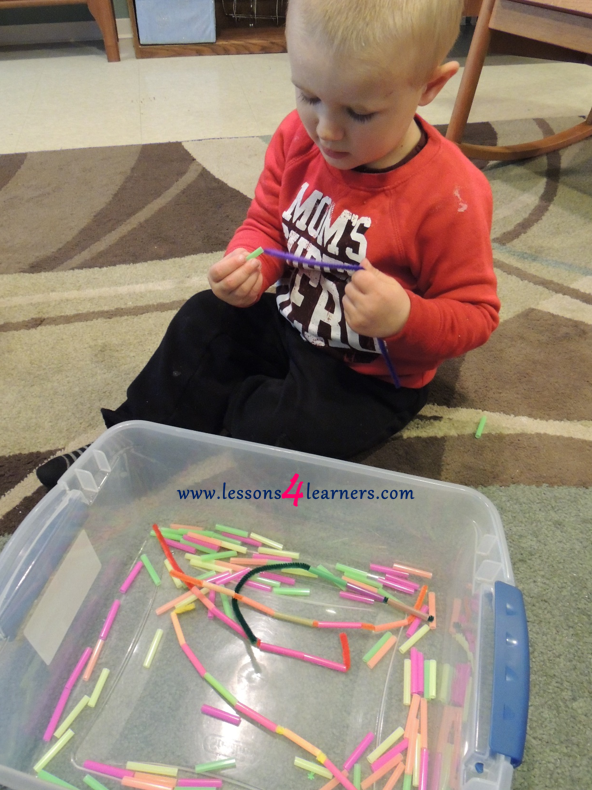 If this is the first time the child has been exposed to the concept, show them how the straw piece goes onto the pipe cleaner. Talk with the child during the entire activity, asking questions and introducing new vocabulary words. Take anecdotal notes on how the child’s threading skills are developing. How long did it take them to successfully get a straw piece onto the pipe cleaner? How many pieces were they able to string? Babies begin to mimic what they see from a very early age, often cooing as part of an exchange with a caregiver long before they are able to communicate linguistically. This is why babies typically begin signing back earlier than they begin speaking. When introducing sign language to babies, it is important to sign and speak with them at the same time. For example, when signing “more” to an infant who may want more food, it is advisable to say, “Do you want more?” While signing the word more. For older infants, who have not had previous sign language exposure, it is fine to start with the recommended signs for the younger age range. Chances are that they will be able to pick up the signs quickly and continue learning new ones as they are introduced. As long as the signs are taught in context and are signed often, the child will benefit from them. 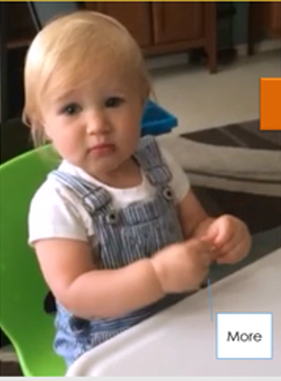 Toddler signs become more specific to their feelings and important components of their daily lives. Toddlers are at an age where they are becoming aware of themselves, their feelings, needs, and the labels or names associated with their world. This is why signs such as happy, Aunt, friend, and bathroom are commonly taught to this age group.